Automotive artistry has been around for generations. This art though hasn’t always been accepted by the established art aficionados of the world. In recent years however, with the proliferation of social media, and car collecting becoming a high dollar industry, automotive art has been coming into greater focus. More and more artisans have been coming out of the woodwork with their paintings, photography, sculptures, and etcetera. I will begin highlighting a few of these artists beginning with this post. Other artists will follow. Some names will by now be familiar. Some will be new to you. In either case, enjoy the stories and experience their talent by checking out their work. 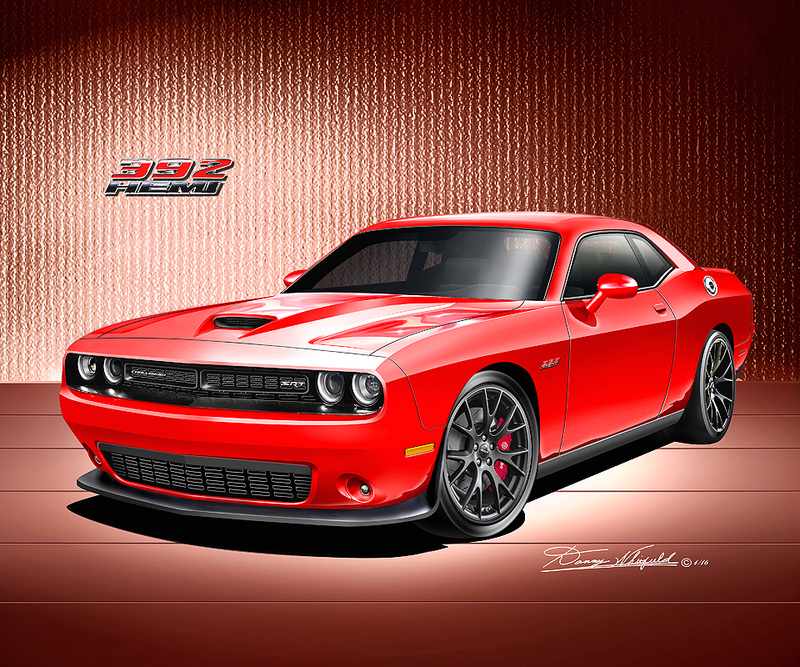 Don’t forget to share this page to spread the news about automotive art. Today’s spotlight is on Danny Whitfield. Danny grew up in Detroit, Michigan and started drawing early. His affinity for the automobile led him to a career with Ford, General Motors, and other design firms. Although he enjoyed creating fine art pieces, the art world didn’t embrace him with open arms, initially. The industry for the most part hadn’t expanded its vision yet to see this type of artistry as a valid genre. 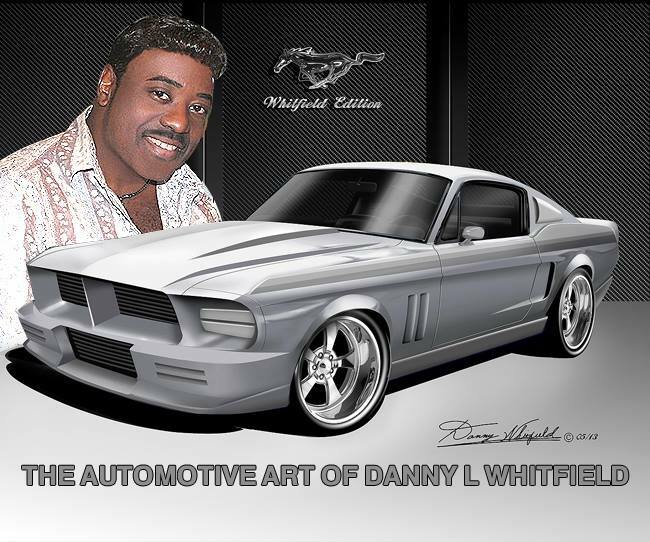 Since then, and determined not to be held back, Whitfield continued to do his fine art pieces and broadened his efforts to have the automotive art genre be more greatly accepted. As a result, he is seen as a key artist in moving this art scene forward. His work has been featured as wall hangings, posters, published in magazines, and highlighted throughout the internet. In fact, social media network growth has aided in ballooning Whitfield’s popularity globally. Strong testaments to Whitfield’s acceptance in the industry have included an invitation he received to do a commissioned work for the National Corvette Museum, and artwork that’s been printed in car magazines such as Hot Rod, and Muscle Mustangs and Fast Fords (among a few). He’s even had Jay Leno and Bob Lutz as clients. I reached out to Mr. Whitfield for a few questions. He was gracious enough to take the time to answer them. The Q&A follows. Art has been a part of your life since you were a young child. Do you remember how you started? To tell the truth I got started at the age of 5. Anything I saw was a canvas to me, school paper, the walls in my bedroom, basically any flat surface with empty space I would draw on. My passion was the automobile and I drew cars every chance I got. Your work encompasses several fields. What media have you used to create your work over the years? What’s your favorite? Photography, oils, charcoal, paint, CAD, etc…? My absolute favorite is Winsor & Newton Designers Gouache paint. The paintings just come alive when using this type of paint. The colors are so rich and vivid, the cars look like they’re popping off the illustration board. Your drawings have had my attention for a long while now. Could you define your style of Drawing? 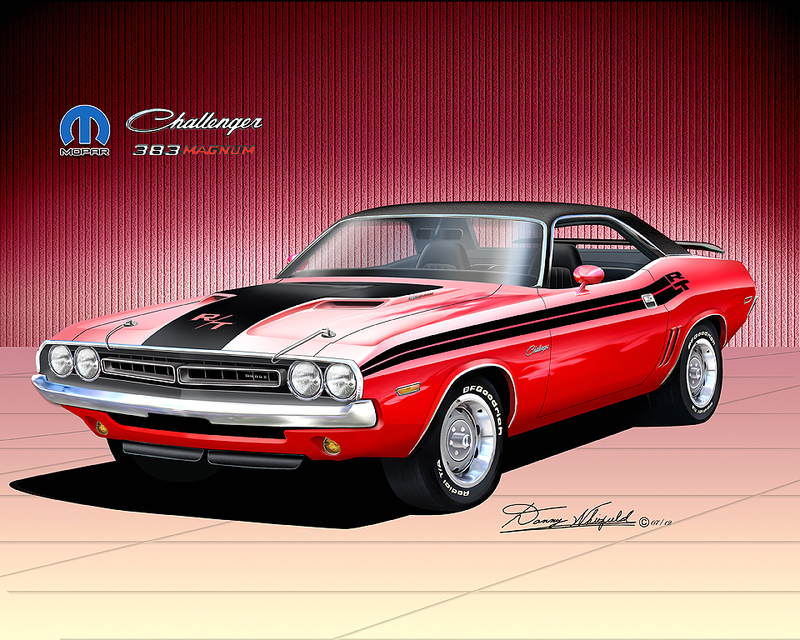 I start with drawing the line work of the cars and backgrounds on the illustration board or canvas. Once I mask off the areas of the line work I apply the paint using an air brush. Once I have everything created, I scan the art into a software to bring them even more alive. I am able to change the color of the car, and add to the backgrounds or change them. What has been your most challenging piece to date? The old Packard’s, Dusenberg’s, or basically any vintage automobile. Those cars have wire wheels, tons of chrome and very intricate details that can takes months to create. But, it’s worth the labor. What is the newest challenge or inspiration ahead of you? How long was it before one of your works was first published? What did it feel like? Ohhh, you want people to find out my age, lol! It was 1989 and man what a feeling! It was like the first time you got paid for your artwork. Nothing compares to that first paycheck. Well my first publication was a news article and I must have made 20 copies of it at the time. How would you encourage others coming behind you in the Automotive Art arena? Grow and study your customers. They are the people you are doing this for if you’re going to do it as a living. Contrary to popular belief, you CAN make a living at selling art but it doesn’t happen all at once. It takes patience. Understanding what your customer’s likes and dislikes are is very important. This is done by publishing your best art and waiting for the positive responses from platforms such as social media, blogs, and much more. Speaking of social media, the best tools you have is the computer and the internet. Gone are the days when art galleries, museums, auto publications, and magazines dictate your career. With the internet you go directly to your customer and build a large audience. With a properly designed website, social media, cars shows, and events you are in control. Danny Whitfield’s art career covers over 40 years. Although his strength has been automotive related, he has also done architectural structures, interior design, appliances and furniture. So, his breadth of knowledge and ability to convey it is vast. Whitfield’s future aspirations are also grand. He has a vision for a museum of automotive art. It would of course include his own work, but also that of the many artists he has inspired and respects. This entry was posted in Car Art - Automotive Art of Danny Whitfield and tagged amazing cars, art prints, artist, artwork, auto blog, automotive art, automotive transportation, contemporary paintings, cool cars, Corvette, Danny Whitfield, Dodge, fine art, fine art prints, interview, muscle car, mustang, poster, sport car. Shop and give the gift of Art for the gear head in your life! 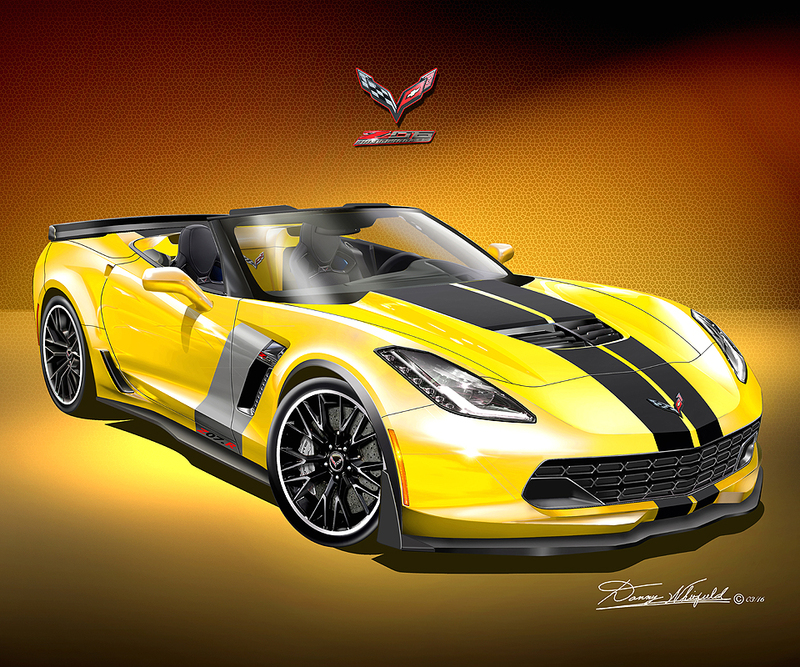 This entry was posted in Car Art - Automotive Art of Danny Whitfield and tagged #chevrolet #camaro, 2015 Chevrolet Corvette, 2015 mustang, cyber monday, Danny Whitfield, Dodge, Dodge Challenger Hell Cat, Ford Mustang, hell cat, mopar.